It's a joy that my 9 year old son has taken an interest in sewing. Now I finally stand a fighting chance at getting my scraps consumed. 😉 The speed adjusts on my machine, so I always crank it to turtle pace. However, I still get nervous that he'll put his skinny little finger under the needle. Perhaps it's because I managed to do that once. You may be thinking, "Why, that sounds pretty dumb. Who could possibly manage that?" At least, that's what I used to think when people said they did such a thing. That was...until I poked my finger under and didn't realize my foot was on the pedal. Fortunately, my pride was hurt more than my finger. Anyhow, now that I've really built up my credibility as someone with great wisdom and attentiveness (sarcastic font needed here), I'll share my thoughts on the Sew-Safe Presser Foot. 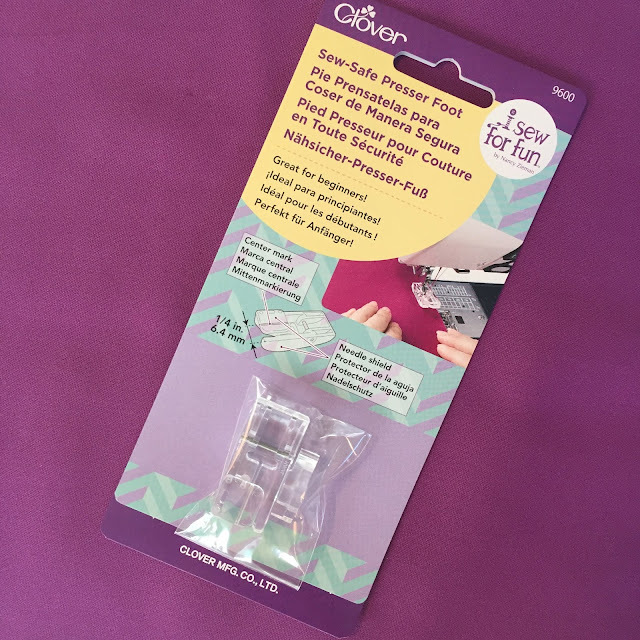 The Clover Sew-Safe Presser Foot comes in the packaging shown above. It features a center needle marking, 1/4" seam allowance, tall sides and top needle shield to deter fingers away from the needle area, and a low shank adapter. Instructions for attaching and removing the low shank adapter are inside the folded paper. Now, if you are the kind of brilliant mind that has ever pondered complex quandaries such as, "How do I remove this needle from my finger?" you may also find a way to manage to put the low shank adapter on backwards. Never fear! In both scenarios, just remove it. Bear in mind that the front of this foot is thicker than your typical foot to give it protective properties. Since I have a Bernina, I needed to use an adapter foot (#75 if you attach the low shank adapter, or #78), which I had from when I acquired a Westalee ruler foot. I did find it a little more challenging to see right where my needle was entering the fabric, but the center line indicates where your line of stitching will be located. Since I had someone else in mind for this product, I'm having the young mister demonstrate. The Sew-Safe Presser Foot makes me much less stressed that an incident is imminent. I'll end with a sample of his work, which is much more Minecraft oriented than my own. 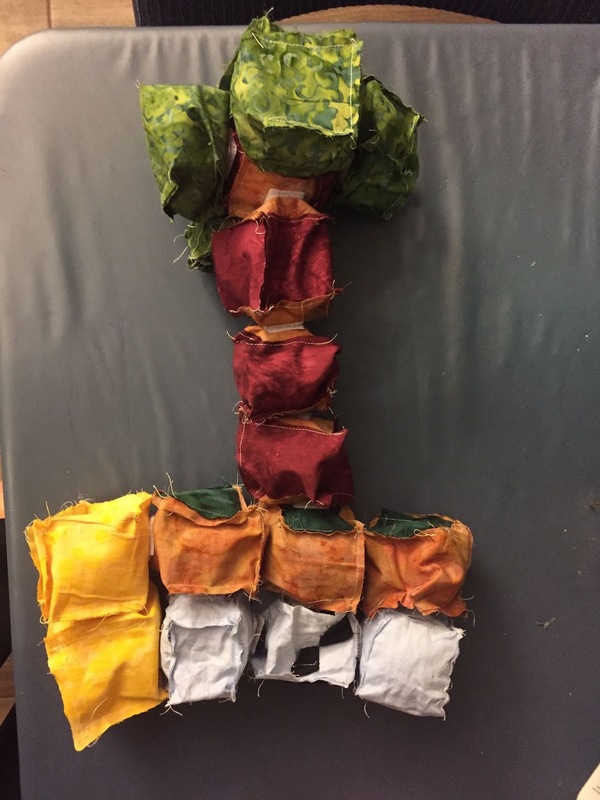 The blocks are connected with hook & loop fasteners from Dollar Tree. Do you ever sew with littles? How do you adjust for your youngster? No littles in my house, unfortunately. May I ask the name of the red fabric above? How awesome that your son is showing an interest. 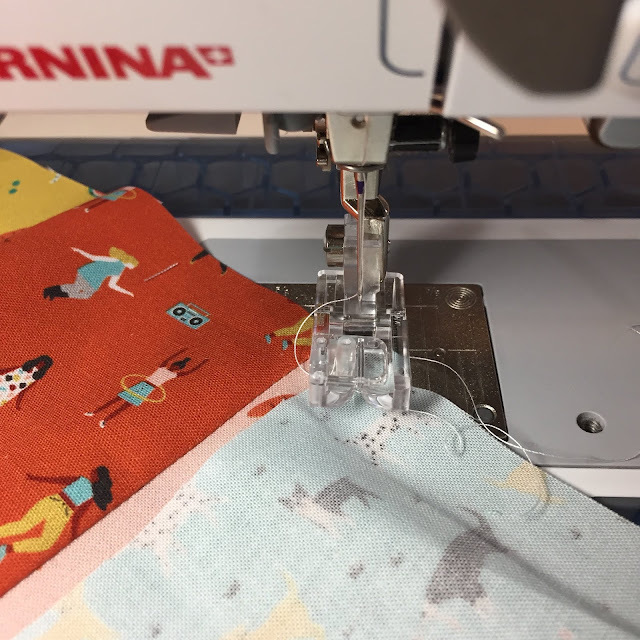 Slowing the machine down, finding a good seat and/or putting the foot pedal on a box to make it comfortable to use, and patience are what I have mostly used when teaching younger enthusiasts to sew.